Win a free trip to see Formula Drift and Global Time Attack together at Road Atlanta on May 11-12. All you need to do is register at the GTA booth at Round 1: Streets of Long Beach on April 6-7. No cost, no obligation, no subscription required, no fuss, no muss. It’s that easy. We would like to welcome Stance|Works as one our newest media partners for the 2012 Pro Championship Season. The just recently launched the new design of their website which is where you can expect to find coverage of Formula Drift throughout the year. Long Beach, Calif. – March 28, 2012 – Formula DRIFT has announced Brian Eggert as the new judge for the 2012 Pro Championship. Eggert will be the third judge joining Andy Yen and Ryan Lanteigne on the panel. 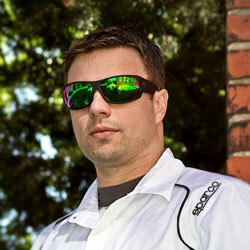 Brian Eggert is an experienced drifting judge having worked with the USDrift Series and several other regional events. Eggert has also worked alongside Drift Association helping to co-create the Pro-Am Series for Formula DRIFT. Since 2003, Eggert has helped create regional chapters across the country in an effort to make safe and legal drifting accessible for enthusiasts of all skill levels. Through USDrift and NASA, Eggert has helped promote the sport of drifting and sanctions 8 organizations hosting events in over 20 states. Eggert will begin his role as judge at Round 1: Streets of Long Beach on April 6-7. He will be taking the position of Tony Angelo, who stepped down to return to the driver’s seat and will be joining the current judges Andy Yen and Ryan Lanteigne. The 2012 Formula DRIFT season kicks off on the Streets of Long Beach on April 6-7. Wrecked Magazine just opened the doors to Fantasy Drift 2012! Sign up now in a public league, start a private league with your friends but have fun. If you want to read up on how to play Fantasy Drift we recommend checking out the feature story in Issue 14 for a complete overview of what Fantasy Formula Drift is and how to play the game. Below you can follow the link which will bring up two videos walking you step by step through registration and how to play the game with our good friend Nik. Sign up, have fun, and enjoy the wild ride of the 2012 season as you manage a four car team against your friends. Tire sponsors and manufactures will be updated as we lead up to Streets of Long Beach. Sign Up for Fantasy Drift Today!